A Year of Being Here: Richard Taylor: "Wild Turkeys"
past the furry shadow of a lone cedar. Whichever way they turn is home. "Wild Turkeys" by Richard Taylor, from Rain Shadow (Broadstone Books, 2014). Text as published by The Writer's Almanac (7/24/2014). 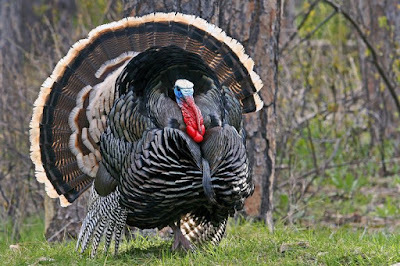 Art credit: Untitled photograph by The National Wild Turkey Federation.